Advanced Interconnections Corp. (AIC), a leading manufacturer of PC board connectors and semiconductor sockets, is pleased to announce the successful recertification of its quality management system to the newest ISO 9001 Standard. ISO 9001:2015 is focused on consistently meeting customer and regulatory requirements while striving for process improvement and risk abatement. 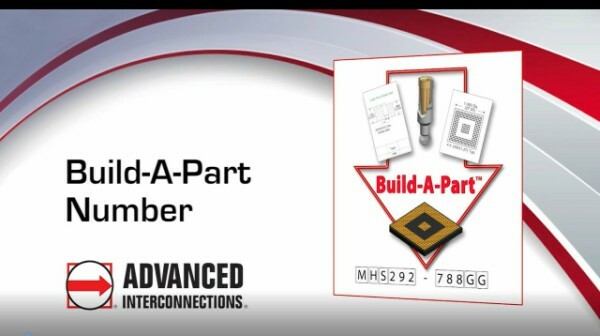 Advanced Interconnections Corporation designs and manufactures electronic interconnect solutions, specializing in customized PCB connectors and IC socketing systems for high reliability test, development, and production applications. For more information, contact customer service at info@advanced.com or visit www.advanced.com. Headquarters: 5 Energy Way, West Warwick, RI 02893 USA. Tel: (401) 823-5200. IC complexity and higher I/O counts have pushed older technology like Quad Flat Pack packages (QFP) to the limit of finer pin placement. Solder bridging between closely spaced gull wing leads of fine pitch QFP packages presents a significant yield issue in production.This, along with other challenges associated with QFP packages such as non-coplanar leads “lifting”after reflow, opened the door for newer, high density packages, such as Ball Grid Array (BGA), that are ultimately more cost effective and process friendly. A robust alternative has been developed for using BGA devices on boards designed with QFP pads. This proprietary technology employs the advantages of the BGA package directly on the board interface –eliminating the design weaknesses and processing challenges associated with gull-wing leads, while allowing uninterrupted production using existing board inventory.